Enjoy your steak with the steak knives of Lou Laguiole. 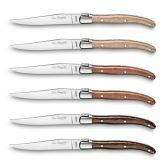 The steak knives of the French Lou Laguiole give your table setting a rustic look and feel. These items are an abosolute must have because of the authentic design and characteristic colors. All knives are Made in France, which means high European quality. The Made in France steak knives combine traditional details with modern day design. Enjoy your steak with this high quality steak set in three different colors. 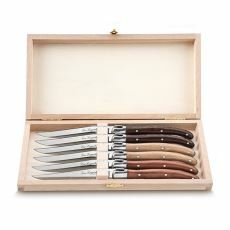 The luxury gift box makes these premium steak knives the perfect gift. The knives are Made in France, which means the quality of the knives is outstanding! 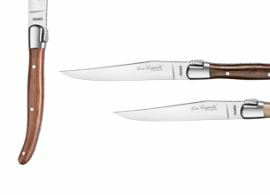 If you're looking for steak knives with an edge, the Lou Laguiole knives are perfect for eating steak. Lou Laguiole has French roots, which is reflected in the design: a combination of the traditional Navaja knife and the French Capunchadou, which was originally used by farmers and shepherds in the South of France. These traditional details match perfectly with the modern day design.